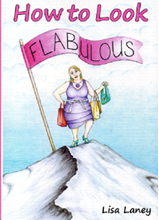 This book is a comic look at one woman’s struggle to get fit, trim down and live life to the fullest with hilarious antics along the way. Join Lisa, a humble hospitality high school teacher,as she battles the bulge, attempts the Tongariro crossing, falls down a hill and knocks herself out and gets back on her feet ready to do it all again. This journey showcases the highs and lows that go with living life in a media driven world where beauty is the new currency. Read more click "here"
To place an order with your delivery address and contact detail. Click "Here"
Read Lisa's book reviews "Here"
Mr and Mrs Branigan are retired and farm on a small plot of land in New Zealand. While Mr Branigan is kept busy feeding his animals Mrs. Branigan bakes a pie for his dinner as she does each day. Mrs Branigan is very well known for her pies and is often called upon to bake for others in the community. One day when Mr Branigan came in for his dinner Mrs Branigan went to retrieve the pie she had baked and left on the window sill to cool. When she got there she found only an empty pie plate. This is the first time she has found an empty pie plate. The big question is who could have taken the pie? This book is yet to be published. Keep coming back for up dates on it's progress. Halfway through illustrations slow progress but at least it is progress.